You’ve probably seen Back to the Future mentioned on the internet quite a bit of late, and just to enter into the spirit of things, after re-watching Jaws 18 in readiness for the sequel, I fired up my hover-converted Spectrum +2 to sample Image Works’ 1990 movie tie-in Back to the Future Part II – which, as is the nature of movie tie-in games, has a tenuous link to the film of the same name. 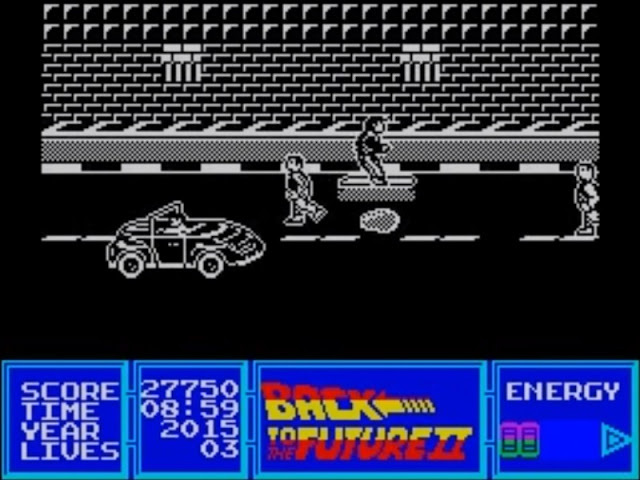 What we have here is effectively five mini-games, ostensibly set in the various time zones used in the film – the present day (1985), the temporal nexus of 1955, and the incredibly futuristic October 2015 – each representing a key scene from the movie. Being such a big game, it’s multi-load hell on a 48k machine; the 128k version is better,and also has some rather nice in game music, including a rendition of the main theme to accompany level one. Speaking of which, level 1 is a hoverboard chase through Hill Valley – and I’m here to tell you that hover boarding is not as easy as it looks, especially while having a fight with some 21st century goon or trying to avoid Old Biff (who is a complete git and will take you down with that cane of his if you get close enough). 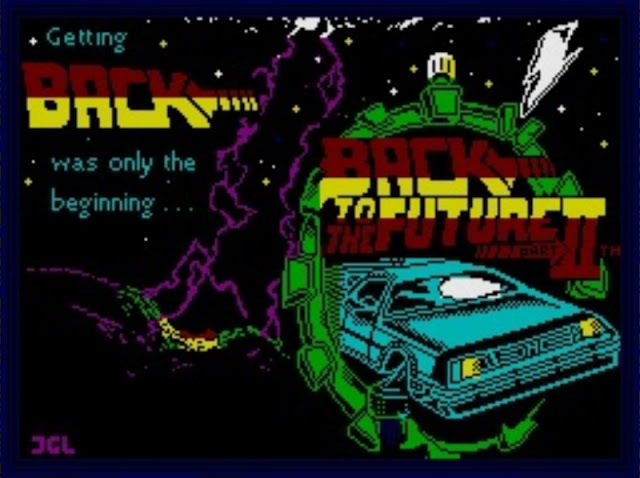 And it’s ok, once you get to grips with it, the scrolling is smooth and takes you past some recognisable landmarks like the Texaco star and Café 80s, and features a few nice little animations like Marty’s foot pushing off as he hove rboards along, and the recognizably hunched figure of the aforementioned Old Biff. Along the way you can pick up plutonium and other random goodies to replenish some of the energy you lose trying to fight off Griff and his minions. It’s kind of a variation on the Paperboy theme, only with a hover board instead of a BMX, and punching bad guys instead of delivering papers. 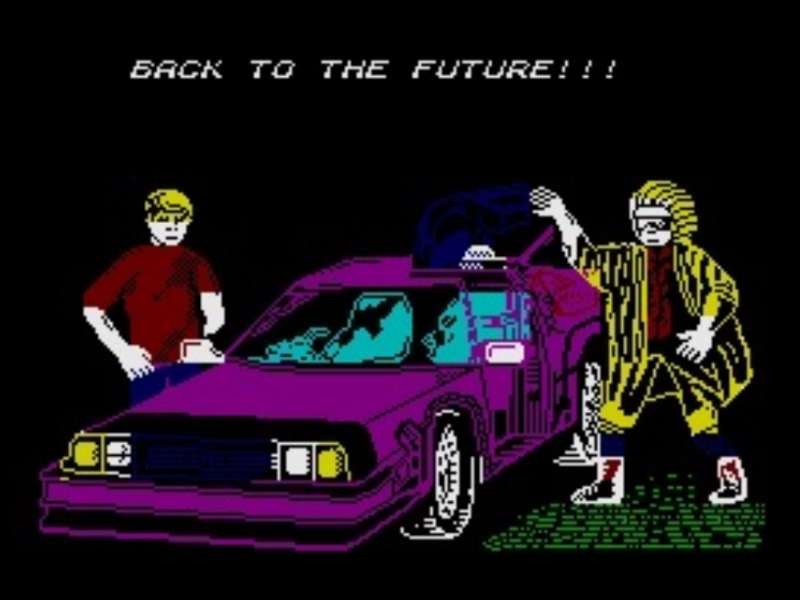 And you thought Back to the Future was a wholesome family movie! 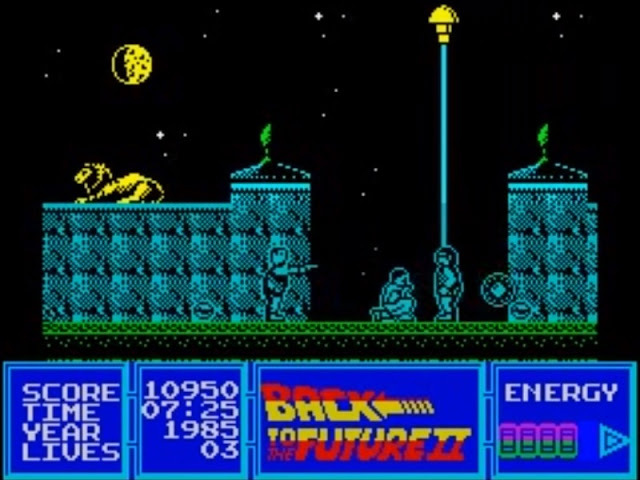 It’s a single long level but with a few save points along the way, so after a bit of practice you reach the courthouse, get Griff arrested, save Marty Junior and move on to level two. Which I found immensely confusing; in theory it’s a puzzle game based (loosely) on some kind of automatic door system the film-makers think homes might have in 2015. You have to figure out how to open these doors in combination in order to lead Jennifer safely out of the house without meeting her future family, all the while battling the colour clash which makes it nigh on impossible to even see the characters at times, never mind figuring out which is which. Colourful, but mind-bending (and not always in a good way)! 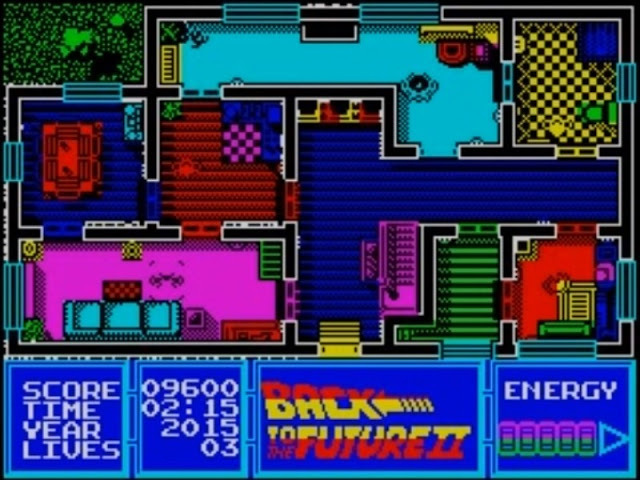 Level three sees us safely back in 1985 – but it’s gone wrong! We’re in an alternate timeline where Hill Valley has become the set of a pants beat-‘em-up, and the only way to fix it is to mash keys wildly whenever someone approaches and hope you manage to, well, beat ‘em up. Seriously, I know Marty never really got violent in the films, but this level could have done with some decent combat moves. On the plus side, the background music is nicely atmospheric, the graphics are nice, and I’m pretty sure I recognize the alternate Strickland, which is impressive. Also, the bad guys’ bullets seem to pass right through Marty, just as if he isn’t there – which he won’t be if he doesn’t get back to 1955 and sort this mess out! Which is of course done by means of a sliding block type puzzle game in level 4. 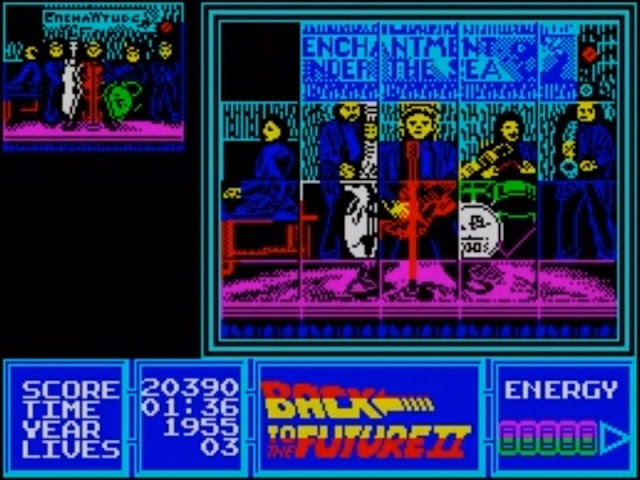 It’s colourful, animated, and accompanied by a jolly little tune that may or may not have been Johnny B. Goode; a good little game if you like that sort of thing, and a break from the action sequences either way.